Bottom Line: Buck for buck, the Rebel Ti is one of the best 35mm SLRs you can get. It has many features which are close in quality to professional models, and an autofocus that rivals them. And though it is built of cheaper materials, the Rebel Ti is a great choice for those looking for a less expensive entrance into the world of SLR photography. Since Canon began producing its EOS Rebel sometime in early 1990, the Rebel line of 35mm budget-SLR cameras has achieved a level of popularity amongst amateur photography enthusiasts unprecedented by its competitors. Its success is due in part to the consistent design retained throughout each generation, but mostly to its high (excuse the idiom) �bang for the buck� factor. Now beginning photographers could afford an autofocus SLR camera with many of the features of a professional setup. 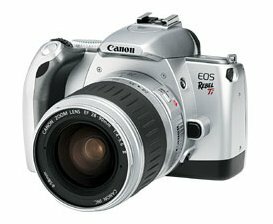 In fact, the Rebel prompted such a high level of sales that Canon produced revision after revision of the camera, with each new Rebel handling much the same as the previous, but enhanced with new features and increased functionality. Such is the case with Canon�s most popular 35mm Rebel to date, the EOS Rebel Ti (aka 300V, Europe; Kiss 5, Japan). Featuring autofocus speeds that rival professional systems priced over three times as much and an ergonomically crafted body both lightweight and easy to handle, it would not come as a surprise that it is also the most expensive camera in the 35mm Rebel series. However, at around $170 for the body, even the Ti is a more than affordable solution for most.